Abe Cohen Plumbing and Heating Inc. is who you need to call for sump pumps in commercial buildings in Ahuntsic, Baie D'Urfe, Beaconsfield, Bord du Lac, Cote Saint-Luc, Cote St-Luc, Dollard des Ormeaux, Dorval, Downtown, Hampstead, Ile Bizard, Lachine, Lacey Green, Lakeshore, LaSalle, Laval, Mile End, Montreal West, NDG, Nouveaux St. Laurent, Nun's Island, Old Montreal, Outremont, Pierrefonds, Plateau, Pointe Claire, Pointe St. Charles, Roxboro, Ste-Genevieve, St. Henri, Town of Mount Royal, Verdun, Ville St. Laurent, West Island, Westpark, Westmount. A sump pump removes excess water from under a building. The life expectancy of any particular sump pump depends on its quality, age, operating environment, and amount of use. 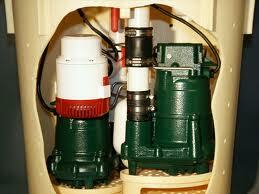 A failing sump pump should be replaced at the first signs of wear or problematic operation. "Sump" refers to the pit (below floor level) where excess water accumulates. The motor of a column type sump pump sits above floor level while its submersible section sits in the water to be evacuated. A submersible sump pump has the entire sealed motor/pump unit submersed under water. Often in commercial installations, a duplex pump system is used. A pair of sump pumps are operated by a control panel that operates the two pumps alternately so that both pumps are used frequently, which reduces the likelihood of a pump failing from lack of use. In the event that the water level is too high, it runs both pumps simultaneously. A high-water alarm can also be connected to this system. Failure of any sump pump in the wrong circumstances can be disastrous. For this reason, smart building owners have a back-up water-powered or battery-operated (typically 12-volt) pump sharing space in the sump pit with the main pump. In the event of a power failure or a pump failure, the water or battery-operated pump takes over (with the possibility of an alarm sounding to inform you that corrective action is required). We are equipped and trained to verify and test the functioning of your sump pump and the entire evacuation system, and to advise you concerning improvements and redundancy (back-up). If you are not sure that the pump works, run enough water into the sump pit to trigger the pump, which should empty the pit quickly. If you suspect that the pump may be getting old or is not working properly, call us for an inspection and verification. When it comes to sump pumps, there is no "economy" to buying less than the best quality of equipment. The consequences of a flooded basement are too serious and too costly to justify anything but a near failsafe installation. At Abe Cohen Plumbing and Heating Inc., we are a three-generation family business with more than 50 years in the plumbing trade. We consider our customers to be family and friends in a long-term relationship with us. We have the experience, expertise, tools, parts, and equipment to perform all sump pump installations and service in a commercial building in the greater Montreal area. We are respectful, clean, and professional. We are certified and active members of CMMTQ (Corporation des maîtres mécaniciens en tuyauterie du Québec), ACQ (Association de la Construction du Québec), and certified partners of Gaz Métro for natural gas piping and installations.